I want to interface serial communication via com ports but the error occurs , I am using this code. Error snapshot attached. number in the double format according to IEEE 754 to a decimal number. the example you are using was made for Rex version 2.10.8 and can be compiled without any errors in that version. Is there any specific reason for you to use Rex version 2.10.7? I would recommend you to upgrade to current stable Rex version 2.50.1 - for changes see https://www.rexcontrols.com/development-history. Is it possible to combine this program with a parsing algorithm so that we can read a data from UDP/Realcom and parse it and then export using OPC .I want to design this complete system to read flame scanner frequency and integrate it to DCS system in 600MW power plant. 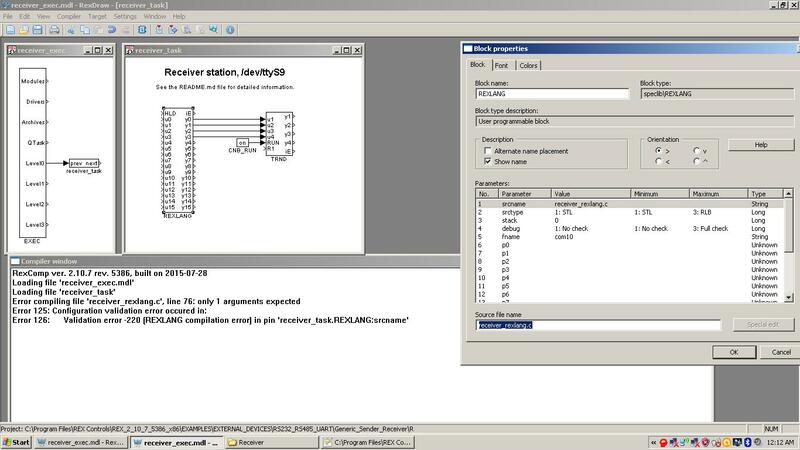 it is possible to combine Serial communication with UDP communication in one REX project. Our team can also help you with the customised implementation according to your needs - just contact us.